We will first search to find all the seven species that the land of Israel has been blessed with : "... Land of wheat and barley, vines, figs, pomegranates, olives and honey". After some riding, we will leave the biking and explore the ruins of Itri and Madras, dating back about 2000 years. We will delve underground where we will discover a system of hideout caves that were once used by Jewish rebel soldiers against the Roman army in the first century. After we explore the caves on our hands and knees, we will return to our bikes and continue riding. The tour can include the Ella Valley where we can re-enact the famous battle between David and Goliath in the place where the bible says it took place. - The package includes bike and helmet rentals. - Tours are lead by experienced and licensed tour guides. - Transportation and meals available. 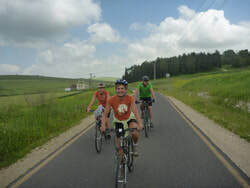 The Judean Hills family tour is a half day program including easy riding, suitable for families with young children. We explore the plants & trees along the way, and crawl through the Bar Kochba caves, as we tour through the pleasant side roads of the Adullam region.